Melt the butter on a medium heat until it's a nutty brown color. Sieve through a kitchen towel and allow to cool. As soon as the beurre noisette is cold, add the sugar and eggs and beat until foamy. Add the bananas to the mixture and stir in briefly. Mix the baking powder into the flour and sift into the bowl. Stir in. Toast the walnuts in a frying pan without fat, and break into slightly smaller pieces. Stir briefly into the mixture. Preheat the oven to 350°F (180 °C) and (briefly!) warm the cake tin to make it easier to grease. (Or else use a silicone tin, which doesn't need to be greased.) Grease the tin, and pour in the mixture. The tin should only be filled up to 3/4 capacity as the cake will rise. Bake for 55-60 minutes in the lower third of the oven. 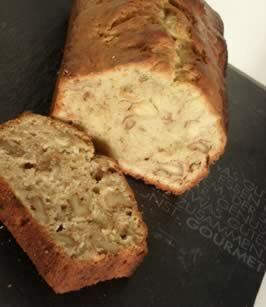 Test with a metal skewer - if no mixture sticks to it then the banana bread is ready and still moist. Allow to cool in the tin for a short while, then turn it out and leave to stand. Variation: Bake the banana bread in a muffin mold for 25-30 minutes. So that they fit very well into muffin gift baskets.